intuitive, comprehensive approach to sound system design. Watch this short video and click on the tabs below to learn more. Earn 24 RUs and 12 CEDIA CEUs. More seats = bigger discount! The performance of a sound system is heavily influenced by the room in which it is placed, so much so that the room’s acoustics must influence the design process. Everyone knows this by intuition, but few designers understand how to allow the room to influence the system design. Our 3-day Sound System Design seminar begins with instruction on room acoustics. Pat Brown will demonstrate how to collect and interpret the Room Impulse Response (RIR), which is the acoustic signature of the room. He does this in a fast, accurate, practical manner that reduces site time while yielding high quality, useful data. From there, he will help you understand how the loudspeaker interacts with the room to produce a direct-to-reverberation ratio at each listener position. Understanding loudspeakers and their specifications is vital for selecting the best type of loudspeaker for your design goals. Pat helps you understand and use specifications like sensitivity, directivity, power handling, and amplifier power ratings. He’ll demonstrate how to use 3D computer modeling in a practical way to evaluate how all of the design variables interact. Humans design sound systems, but the computer can speed the process. Highly intelligible sound systems, just like good room acoustics, don’t happen by accident. Both are achieved by a purposeful process guided by over a century of theoretical understanding. Pat teaches this seminar with passion. Why? In his early days, he made the common mistakes and it cost him a lot of money and time. Pat had to learn these principles the hard way. He will show you tips and techniques that will greatly shorten your learning curve. Course Manual – It’s not a manual of PowerPoint slides. It is reference-quality and filled with useful graphics. You’ll get a PDF version after the course. Audio Click-Rule – A Windows calculator program that demonstrates the interaction of the variables in these systems. Who Should Attend: Anyone who selects and places loudspeakers in rooms. Enjoy looking at some photos taken during the Sound System Design seminar. Some of the photos were taken of an evening site visit. I am scheduling a flight, what are the class times? The class starts at 8:30 am and ends at 5:00 pm each day. The doors to the classroom are open at 8:00 am. Typically, we do not end early on the last day. The fee includes the instruction, class materials (full color manual, Audio Click Rule, support files, and certificate of completion), beverage service, and lunch. You are responsible for your breakfast, dinner, and overnight accommodations. My company uses purchase orders, what is the best way to register? Please call (812-923-0174) or email me (bbrown at prosoundtraining.com) your purchase order information. I will register you for the class and send you the required paperwork. Will I get a confirmation after registering online? You will receive an immediate confirmation and a credit card receipt if you sign up online. The receipt will include an activation key to that seminar. Please forward that key to the person who will be attending the seminar so they can activate the key with their information. I will send another email about a week before the class with last-minute reminders. It is very important that you read this. It will contain information about what to bring , location, times, special events etc. SynAudCon provides all-day beverage service and lunch each day. Lunch provides a great opportunity to network with others seminar attendees. If you need a special diet, tell me on the first morning. The hotels are usually very good at accommodating us. There are different requirements for the different classes. Sound System Design: Bring a notebook computer if you would like to take part in class exercises. For you Mac users, the Audio Click Rule will work if you have Windows installed on your computer. The course is like glue – its ties together a lot of concepts that we may have encountered before. The cohesiveness of the course contents is especially good. A.W. Pat and Brenda – keep doing what you are doing. This knowledge is vital to our industry and world at large. N.A. Pat’s knowledge of the subject matter on both a theoretical and practical level is immense. This comes through in everything he says . Brenda makes the day seems more like a family reunion than training. R.W. Ample food and breaks throughout the day. Relaxed environment. Very interesting content. N.M. The seminar was very well organized. I took away a lot of very useful information. It would have been nice to have some equipment for a closer look. Well Done! A.L. Fantastic, pragmatic approach to the subjects. Pat is a great teacher with an incredible depth of knowledge that is communicated very efficiently to students. Thank you! R.C. Lots of very useful material was covered, and more importantly, clearly, in depth, and in a manner that I could understand. I really appreciate that the information is not manufacturer-specific, and at the same time, multiple brands/models are mentioned, along with the pros/cons. The real-world room testing with HVAC noise and all is very helpful. present this information to the powers-that-be. Food was very good. And this is coming from a person fairly knowledgeable about food. W.R. I just want to say it was an amazing class that I had been looking forward to taking for awhile now. Pat did an awesome job explaining the topics in a way that I could understand. I am now applying to a theater project I’m designing this week. I would like to say thank you to both of you and the hard work and effort that went into putting that together. I’m looking forward to the next class. Thanks again! T.S. The overall course is amazing and highly worth the cost and travel. It’s a lot of information to absorb without practical exercises to compliment the training. P.P. WOW! What a valuable training course. It was so informative and detailed. So much to adopt and implement. Thank you! D.W.
Pat’s seminar was excellent. He delivered the technical content in a way that was easy to understand. The demonstrations were very informative. Brenda kept things running smoothly and brought an uplifting spirit to the seminar. Pat and Brenda are a first class team. Thanks! The tools presented and given out during the seminar make it worth being here alone. But to cover so much valuable content in 3 days is awesome. And although there wasn’t a lot of new content presented having it all pieced together efficiently then demonstrated really brings things I learned over the years together. No Name. The seminar was quite advanced, however I have studied similar material several times before. The goal was to refresh my knowledge and further my understanding of advanced topics and Pat did that extremely well. T.D. The course is an excellent balance of technical theory with practical application and reality. A.H. I really enjoyed the seminar. There is so much information I could use in future projects but not too much that it was hard to follow. J.M. Pat offers a wealth of knowledge that will help you prove your skill set weather you are a novice or seasoned professional. D.C.
Pat is clearly an industry expert. How can you put a value on that? I can only hope that I can acquire business that allows me to implement these skills. D.S. Pat’s ability to present challenging content in a concise, understandable way is truly amazing. The mixture of theoretical and the practical is incredible. WOW, Just WOW! J.H. Pat provides an efficient, straight-forward approach, free from brand influence, to get the information across that you need. I recommend taking the courses again to help cement the knowledge. F.C. I found this to be very enlightening. It explains many of the anomalies I have encountered over the years doing sound. I enjoyed it very much. H.C.
Great delivery from an industry professional. The material had real-world examples which really illustrated the value of the material taught. D.B. I really enjoyed the actual examples / demonstrations that bring the point home. I typically learn best when the actual process is done vs someone talking abut it. B.W. Showing the current best tools was very helpful. J.B.
Pat does a great job of giving you the concepts in an easy to follow way. I like how he gives you enough to understand the concept but still leaves you wanting to learn more on our own. Z.B. I would like some “hands on” in taking the measurements and using the software. Very informative and approachable. Thank you for making this available. A.S. The demonstrations spoke to me. D.W. I didn’t know all the information you gave about Room Impulse Response (RIR). It is an incredible and very useful. Thanks you! G.G. It was a lot of theory – that is good but a bit dry at times since I am a beginner. I really found the demos, personal experience stories, and comments from the site visits the most helpful. Those things made it click. J.U. What an incredible class! Pat takes complex concepts and brings them to life with unique, real-life demonstrations and clear explanations. I especially enjoyed all the facility tours and listening to the variable acoustics (thanks to our amazing host). The lunches were fabulous. Great networking with other class mates. A+ rating. A.M. The audio listening examples to demonstrate the concepts was very helpful. B.F. The first Sound System Design was in 2005 and that changed my professional life. Today I learned so many new things that I thought I’ve already knew. A.W. It was really informative and it will help me working on site with improving the acoustics. Thank you for the good quality of training. S. H.
I appreciate Pat’s real-world application of complex audio concepts helping me (an analog guy) grasp digital mapping concepts. I look forward to taking another course with Pat and spreading a good word about SynAudCon. J. T.
Pat displays an incredible level of expertise in this field. The way he explains the concepts is clearly backed up with years of experience. I wasn’t able to follow all of it but I still benefited greatly from this class. I.H. I was hoping for a bit more design of sound system with practical application of the calculations. The last day served me the most. The first 2 days was mostly review for me. R.T. Page 34 of the manual was the most useful to me and worth the cost of enrollment. This course provides a solid way to improve sound system design skills. K.W. I loved the show and tell portion because I learn best by example. T.G. Pat and Brenda did an excellent job of preparing and executing this sound system & acoustics seminar. As an acoustician, I found the overlap between sound system and room modeling of particular interest. I will certainly be revisiting what I learned here as I progress in my career. C.G. The class was incredibly comprehensive covering all the factors you need to consider when designing a system. Impulse responses – how to record then use them to get an understanding of room acoustics. No name on evaluation. It’s been several years since I’ve attended one of your classes. I learned several new things. Thank you for keeping it fresh. M. P.
Pat is brilliant! Even though sound is a complex thing to explained, he does it in a way that is easy to understand and follow. Learned Loads! Kudos to him and Brenda for being awesome. S.W. Great Info and demos on available software tools. Showing a typical work flow from start to finish would be great as well as a hands-on exercise project room using the tools would help retention (this may need to be a separate class. D.M. For AV integrators, there was a lot of useful information may go deeper in detail than what is needed. Instructor’s knowledge audible demonstrations and campus tours were truly outstanding. No Name on Evaluation. Pat’s knowledge and experience is what makes this seminar work. Anyone can spit out “How To” information. He brings the understanding that every system design and room is different and how to work with that. J.E. My first Sound System Design seminar was over 30 years ago. I was very new to the field and I learned so much. This time around I was expecting the same, but perhaps that is not realistic. I would enjoy diving a little deeper into the math behind the tools. This class reinforced things as well as teaching me new stuff. B.T. SynAudCon does not disappoint. Everyone told me how valuable / worthwide the seminar would be and they were right. C.K. My favorite part was the demonstrations that allowed hearing all the concepts discussed in detail. It makes everything come to life and more applicable. L.N. Learning the use of the visualization software, gathering the IR’s from rooms on campus, hosting everyone! Let’s do it again. D.M. I like the ability to use modeling programs to see how the sound reacts to the room. I am going to use the modeling program to see what is happening at our church. R.F. This is the best course SynAudCon offers – my favorite course. Loved the stories told during the training – tell more. S.S. The use of Messiah College and “real” spaces was ideal. This is way better than doing a seminar like this in a typical hotel ballroom. J.L. Overall an excellent seminar and a very good value. Would like more time to delve into the software. Good Practical concepts without compromising theory. F.J. I enjoyed the use of modeling and the different programs that were introduced. N.E. I really appreciate Pat’s ability to simply complex issues into an easy to comprehend idea. I plan on using many of his illustrations with my clients. C.G. I very much enjoyed the class. It was a good fit for where I am in my audio journey. B.W. Pat’s illustrations point very well. I am a very visual learner and this helps me tremendously. I also appreciate Brenda’s wonderful support and hospitality! You two are a wonderful team. R.D. SynAudCon – brilliant light in a sea of misinformation! J. M.
What an incredible experience. The information was amazing. I have never had an audio training, nor been around anyone with this level of experience. I am looking forward to putting it to use. It is very clear that Pat has a tremendous amount of knowledge. I appreciate him sharing his stories and experiences. The fact he can make something very technical simple to understand is a skill. Coming from an EE background, I certainly understand the math, physics and how waves work. However, this was real information that I can put to use in our day-to-day designs. For me the biggest impact was how Speaker Arrays work. The demo kit you built was spot on to show me how this works. I learned a tremendous amount around how sound works and where to focus the sound for our participants for the best experience. I have had experiences in the past where I had, what I called dead spots, in the audience area. I was able to move these around but I did not realize why they were happening. Based on the math now I understand. Thank you for a great experience and simplifying the best you can a complicated component of our solutions. C. A.
I think I’ve been to all of your seminars and taken most of the online courses. I always learn something new even it is looking at it from a different angle. There is always several things I can incorporate into my work. The only problem is the more I learn, the less I know! M. K.
You guys do a fantastic job of presenting a lot of information in a very comfortable environment. R. F.
I was thoroughly impressed. The personal touch you add to the training makes a huge difference. The content that was over my head sparked me to broaden my understanding. I will definitely take the online courses and in-person training and will start requiring it for my installers and sales reps. J. F.
This is the second time I attended this course. There isn’t anything out there this GOOD! I leave exhausted and knowing I will not retain everything because there is so much useful information. Thank you for all that you do! S. H.
Excellent presentation overall! It made be consider some things I didn’t know, confirmed some ideas and inspired me to dig further into several topics. Great Job! B. S.
After 40 year of SynAudCon classes, it is always good to see positive changes and teaching in a technology intense field. Thank you for this opportunity!! R. O. Being an individual who is new to the industry, some of the material was too complex. I will still utilize the information presented in the seminar now and and in the future. Thank you!! M. P.
It’s not just being informed, but I also got to experience everything presented through demos. P. L.
I have been wanting to attend for many years. When this opportunity came up, I jumped on it and I am not disappointed. Many lessons were new to me, some was reinforcements, with the remainder challenged what I was previously taught. Ninety percent are new construction, I would like to see more detail on the execution process of predictive models. A. C.
Great examples on what we were learning and how to incorporate it into day-to-day jobs. By doing this course, it made me a better AV integrator. Thank you!! A. M.
Thank you for your humble approach and humor to education regarding the audio industry. Thank you for being personable and for making hard concepts easy to understand. Can’t wait until the next training. D. M.
I had a blast! The course was more than I expect and Pat has a great and wonderful way to present the subject. Also met beautiful people, and friends. Plus to see Don Keele at work is an honor for me. Thanks for everything, you always make everybody feel at home, you are the best! thanks, Brenda. Amazing Demos. Everything was perfect! Can’t wait for the next seminar! A. O. Loved the knowledge base and resource awareness. I would like to see more scenarios and have the students go through the process multiple times. M. C.
Really informative! Pat was an excellent instructor and kept things interesting. Really enjoyed the stories. My only suggestion would to be to have more hands-on activities. No Name. This was an extremely valuable offering – the universally applied methods and knowledge and the resources to help you apply it. I will definitely recommend this to others in the industry. J. S.
I am a visual learner and I loved the manual. I wish it was 3.5 or 4 days long. J. S.
What I wouldn’t give to have an extra day to this conference. Honestly there is so much useful information that I feel I need an extra day to digest, discuss and apply this info. T. T.
Wish I could go back in time and redo some of my jobs. M. B.
I thought Pat did a fantastic job of repeating the information in several ways to drive the point home. I’ve learned several things, especially acoustics that I can take with me to further and improve my career skills. M. B. Very informative. Loved the live demos! No name. I like the way Pat answers the questions with facts and examples. It would be good to have “take away points” at the end of each day – a summary to help retain the information. B. M.
That was an excellent class. As usual, an incredible amount of material is covered. For someone new to this area, it may be too much content for 3-days. The site trip was very interesting. Thanks again for another great SynAudCon experience! D. S.
Great Course. Very good coverage and well delivered. G. V.
Awesome! Awesome! Awesome! Tons of useful information. I can’t wait to go out and apply it. T. C.
This seminar rated far above my expectation!!! S. B.
Glad to put a rest to my misconceptions. A wealth of information to spread across many people which was impressive. S. B.
I took the 4 day designer course in Louisville Kentucky in 2005 and I still think it the best training I have had in Sound. G. P.
Loved the seminar. I learned so much. I loved how everything gets explained in simple terms. I think it would so cool to do a modeling workshop. Just an idea. Thank you so much. You guys rock! T. R.
The visuals, simulations, demonstrations make the topics very accessible. Suggestions for software and hardware tools along with use in sessions are very helpful. The passion for the topics and real-world applications and experiences shared keep interest high throughout the class. Networking with other seminar participants are very enjoyable and valuable. I look forward to my next SynAudCon experience. Well done Pat and Brenda! K. H.
I really enjoyed it. Thanks so much. You guys do a great job. N. Y. This is such a great training! You can feel Pat’s love for the concepts, and his approach to the material is great for anyone from the beginner to pro. Brenda is great and helped through understanding the course process & expectations both before and during the seminar. I would recommend this to anyone in this field. D. C.
Pat has the unique ability to present complex subjects in a manner that is easy to comprehend. His passion for the impulse response is infectious and it’s uses are my main take-away from the class. D. S.
This course is very well done, every refined, and very thorough. I was impressed. D. T.
I had no idea how much information could be pulled from an impulse response. It’s amazing how useful that can be if you know what you’re doing. So happy I was able to come learn all of this. No Name. Excellent, informative training with visual examples. Outstanding use of AV technology. Brenda’s support throughout the training is huge. Excellent combination from start to end. D. K.
One of the best training I’ve ever attended. Pat is incredibly passionate and knowledgeable. I would highly recommend this course to anyone in the industry. T. D.
The examples of limitations and real-world applications were extremely useful. Thanks! S. R.
I feel the content is superb with a good mix of break time and to let things soak in to keep you focus. Thank you Pat and Brenda. B. W.
Very few classes available provide this level of technical training. I plan to take other courses online as well. 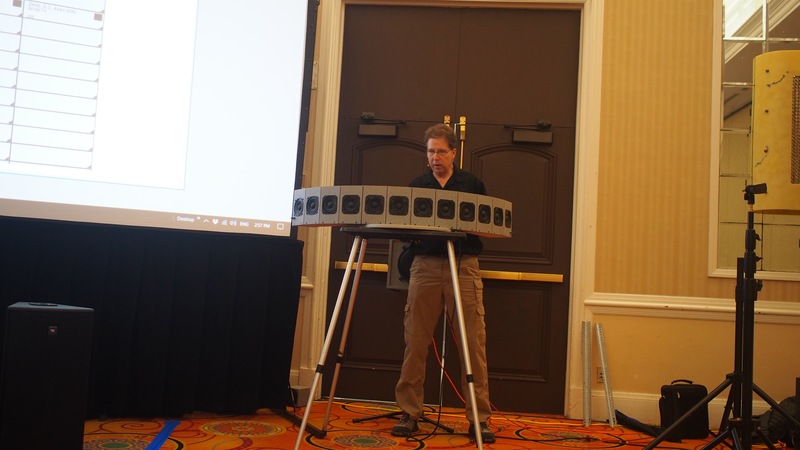 I’d love to attend a version of this focused on conferencing and small room acoustics. G. T.
The detail given in this course is top notch. It is clear as the day that this is Pat’s passion. That makes all the difference. SynAudCon will be my “go to” for audio training! M. R.
Great info in a practical format. The wireless listening sessions and physical demonstrations make all the difference. Please continue to say and repent what each acronym and term refers to, as it seems verbiage / interpretation are often roadblocks in my own understanding of a topic. B. B. The content is truly amazing. But what really brought value was the fact that Pat isn’t just reading someone’s elses (or organization) content. He literally is SynAudCon! The only thing I wish we had more time for was Pat’s process in the design. I feel like we got 90% with the theory and everything, but taking it one step further and designing a sound system for the sake of the class would have been super useful. 🙂 W. H.
It’s changed the way I look at the measurements I’ve been making…. and the way that I have been making them. T. M.
It was really good, very informative, very comfortable (except for the chairs HaHa) and relaxed. M. G.
Impulse Response’s on day 1 will change the way we design systems and provide audio solutions. Day 2 was a great refresher up until the information on the device specific measurement. Day 3 brought it all together. What an opportunity to be taught by someone who has been engaged in this field since before I was born.!! Thank you. J. P.
It was great to learn the “why” behind the reason we do certain things. Having a better understanding of the “why” will make designing systems more efficient and over all end up with a better result. K. B.
Timeliness of session & breaks were great. Delivery of the content was consistent and precise. Sharing of equipment and products used was great. Appreciate the positive information that was shared. S. O. This class has helped to close the gay in my knowledge regarding audio systems and distribution. Specially with moving beyond repenting the industry best practices with understanding the physics behind audio system design. D. S.
I love the way Pat and Brenda work together. H. W.
Pat’s depth and breadth of knowledge, combined with his ability to communicate information is an accessible way makes him a truly invaluable resource and trainer. B.A. One of the most informative seminars I’ve attended. I love how Pat gives practical application for the information given. R.V. More practitioners need to benefit from seminars like these. Kudos to you all. M.S. Incredible course! There is so much to learn from Pat. Truly one of the most informative classes I’ve attended. M.L. Pat is the gold standard for pro audio training. He challenges me to continue learning. SynAudCon is a valuable resource. N.S. Loved the content and Pat did a great job presenting the material. Might be helpful to create 4-day course so students can do more “hands-on” exercises. Looking forward to attending other SynAudCon classes. B.G. The training was very informative and eye opening. J.K.
Pat is excellent communicator. Brenda is a wonderful hostess. Thank you. C.C. Instructor: Excellent, experienced, and masterful. I would recommend more hands on participation. A.G.
Pat is incredibly knowledgeable and conveys the knowledge effortlessly. Brenda is wonderfully hospitable and friendly. Would liked to have more “hands-on exercises. No Name. It’s a most enlightening seminar! Pat is superb at explaining the finer details of sound system design. This is a must-take seminar for anyone designing systems in the sound industry. J.D. A lot of information for three days. In general, it’s a great training. No Name. Great learning environment and content as it relates to sound system design. Food was excellent. No Name. I like the way Pat Brown can explain complex ideas in a easy and understandable way. He changed my concept of audio and how to handle system design. G.S. 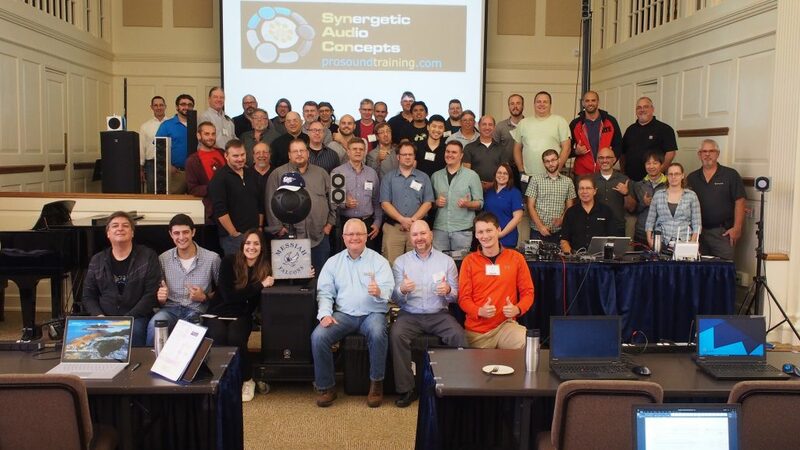 You guys continue to deliver the gold standard of audio technology training. This facility now has intelligible speech, because of the principles I learned at SynAudCon. I wanted to share with you that I have just completed a major sound system upgrade for a cathedral in TN. There have been multiple attempts (by others) over the years to produce intelligible speech in this facility without success. All of the practical skills I’ve learned through SynAudCon were put to the test on this project. Thanks to the advanced knowledge I’ve obtained through SynAudCon, this facility now has intelligible speech in all seating areas and configurations. Thanks to the success of this project, I’ve been approached by others for work in their worship spaces. I could not have pulled it off so well without the help of SynAudCon and all its practical resources. I am humbled and grateful. After countless excuses, I finally did it. After countless excuses as to why I wouldn’t attend the SynAudCon, yet another year, I finally did it. I now join the testimonial group of WOW. It is no wonder Pat and his courses are so popular. Many years ago, Pat took his fluff-o-meter to other conferences/classes he attended as a student. He realized that fluff, like pin one problems, are not so good. The he took his fluff-o-mizer and zapped all that incidental trivia that attempts to make the presenter look God’s gift to Ohms Law. He stayed true to being a normal guy, in spite of the knowledge and skills he learned. Now people like me have someone to look up to and learn from. Thanks Pat, and it is true, Brenda rules. You are blessed to have her. Blessings to you both and your family. I look forward to the next conference. I have a Master Degree but it took SynAudCon to pull everything together. As a graduate of many SynAudCon seminars, I admire greatly what you’ve done from an educational standpoint in the professional audio industry. I may have a Master s Degree from the University of Miami in Music Engineering, but I can honestly say that as far as audio systems design and integration, it didn’t really start to come together for me until I attended my first SynAudCon almost 10 years ago. My SynAudCon experience synthesized much of what I learned in school and helped me apply it to my work every day. It’s also done much to get me thinking about looking for opportunities to teach and mentor others. The seminar was both highly educational and engaging. The seminar was both highly educational and engaging. I was never bored! I liked the hands on approach. The frequent breaks made it easy to ask questions as they came up and not storing them all up for the end of the day. Seminar Location: We are thankful to have this opportunity to work with Crossroads Fellowship Church located in Raleigh NC. In this seminar, Pat spends one day teaching on room acoustics. The church has several rooms with different acoustical characteristics. Pat will be demonstrating and collecting Room Impulse Responses (RIR) in the rooms which helps drive home the principles presented. The church is located 18 miles from Raleigh Durham Airport (RDU). Hotel Sleeping Rooms: We have a room block at the Hampton Inn Raleigh Capital Blvd North. It is located at 3621 Spring Forest Road, Raleigh NC 27616. The rate is $109/night if you use group name – SynAudCon. The room block will be released on 3/3/19, the $109 rate is not guaranteed after this date. You can make reservation online or call 919-872-7111. Hampton Inn is located less than a mile from Crossroads Church. Hotel amenities include: Free Internet, Free Parking, and a Free Hot Breakfast. Nearby restaurants include First Watch, Chili’s Grill and Bar, Big Ed’s North, Alpaca Peruvian Chicken and more. Directions: Please type these addresses into your favorite map program. The seminar will be held in the “Great Room” at Crossroads Fellowship Church. Seminar Times: 8:30 am 5:00 pm each day. Meals: Please eat breakfast before you come. 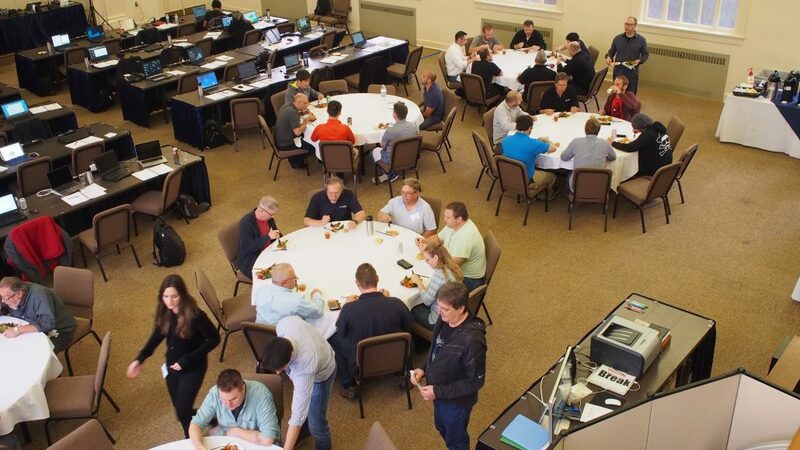 SynAudCon will provide all-day beverage service and lunch.